Can Trump undesignate Bears Ears and other Obama monuments? 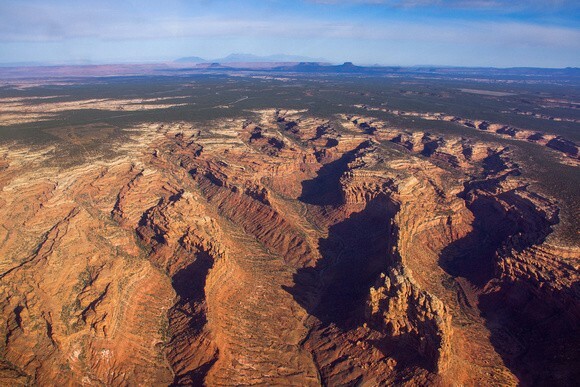 As his presidential tenure winds down in the coming weeks, Barack Obama is expected to decide whether to designate some proposed national monuments, including Bears Ears in Utah and two others on Utah’s borders with neighboring states. But Donald Trump’s surprise victory in the race to succeed Obama likely changes the political calculus behind such decisions, which hold so much weight for southern Utahns who have to live with these federally protected landscapes. On the one hand, Obama won’t be able to punt monument decisions to a Democratic successor, which could make him more inclined to cement his conservation legacy by adding to his already long list of designations. Utah’s Cedar Mesa in the new Bears Ears National Monument. Photo courtesy of EcoFlight. On the other hand, might the president-elect undesignate one or more of Obama’s monuments upon moving into the Oval Office in January? There is no historical precedent for a president to rip up his predecessor’s monument proclamations, but Trump has consistently eschewed political norms during his campaign. “It would be uncharted territory. There are no court decisions since it has never happened,” said John Leshy, who served as general counsel for the U.S. Department of the Interior in Bill Clinton’s administration. Opinions issued by the U.S. Justice Department through the years suggest presidents may modify, but not revoke a previous monument designation. Only Congress should reverse a designation, according to a 1938 opinion penned by then-Attorney General Homer Cummings. “If President Trump attempts to revoke a national monument designation, that effort will almost certainly be embroiled in litigation, and the revocation would likely fail,” said University of Utah law professor John Ruple, a research associate with the Stegner Center for Land, Resources and the Environment. Obama has so far made ample use of the Antiquities Act, the 1906 statute that authorizes presidents to set aside public land of scientific and archaeological value. Obama has designated or enlarged 26 monuments, putting him on par with Presidents Roosevelt and Carter for preserving public lands, historic sites and ocean. Among these designations are 12 Western-state landscape-level designations, covering nearly 4 million acres. Obama has also been asked to designate Gold Butte in Nevada and Greater Grand Canyon in Arizona, and expand other monuments. Additional monuments may serve as tempting targets for a successor bent on muting Obama’s environmental agenda, which critics have blasted as executive overreach. While Trump has vowed to dump Obama’s Clean Power Plan, his campaign was all but silent on public lands issues, instead showcasing stiff stances on immigration, free trade and repealing the Affordable Care Act. Trump has yet to signal whom he might pick to lead the Interior Department, but observers believe Rep. Cynthia Lummis, Wyoming’s outgoing Republican congresswoman, and former Alaska Gov. Sarah Palin could be possible candidates. Another possibility, according to Utah Sen. Mike Lee, is Don Peay, founder of Sportsmen for Fish and Wildlife, who wields much influence over wildlife policy in Utah. “That would be fantastic, for what that’s worth … I’m not sure where Donald Trump will look in terms of his Cabinet. But, yeah, I’d love to see Don Peay in interior. I’d love to see any Utahn in interior, and especially Don Peay,” Lee said Wednesday during a post-election “newsmaker breakfast” at the U.’s Kem C. Gardner Policy Institute. The fate of a Bears Ears monument is inextricably linked to the Utah Public Lands Initiative, or PLI, championed by Utah’s Republican Reps. Rob Bishop and Jason Chaffetz, who cruised to easy re-election Tuesday. Bishop launched the measure to resolve land-use controversies on 18 millions acres of public lands in seven eastern Utah counties. A primary goal of the bill is to dissuade Obama from proclaiming a new monument in Utah — so a Bears Ears designation has been widely viewed as a deal killer for the PLI. Bishop’s office was not prepared to comment on how Trump’s win could affect the prospects for a Bears Ears monument or for the PLI, which has cleared the House Natural Resources Committee and is awaiting debate on the House floor. A companion bill would limit presidential authority to designate future monuments in eastern Utah. Chaffetz remains concerned Obama may set aside Bears Ears, asserting that the move has “no local support,” even though the monument was proposed by five tribes with ancestral ties to these lands. There is no dispute that Congress can reverse any Antiquities Act designation, though this has happened in only a handful of instances. There is legal precedent for presidents to trim monuments, but it’s less clear what would happen if a president decided to completely revoke a monument. President Woodrow Wilson in 1915 reduced Washington’s then-Mount Olympus National Monument by half after some argued that the region’s timber resources would be needed with the advent of war in Europe. The monument’s designation was later upgraded to Olympic National Park, which regained some of the lost territory. “The record is pretty clear, these designations are sticky,” said Leshy, now a professor at University of California’s Hastings College of the Law. Congressional Research Service reviewed the monument-reversal question at a time when President George W. Bush was being pressed to revoke President Clinton’s designation of Grand Staircase-Escalante National Monument in southern Utah. This is because presidents have no inherent authority over lands. When designating monuments, the president is acting under authority delegated by Congress, so the designation is tantamount to an act of Congress itself, Baldwin reasoned. Gavin Noyes, executive director of Utah Dine Bikeyah, hopes that Obama uses that authority to designate a Bears Ears monument before leaving office. His group helped develop a conservation proposal for the Bears Ears Buttes, which harbor countless ancient American Indian sites in a maze of remote sandstone canyons and mesas. Though Chaffetz argues that “things done in twilight of the presidency are suspicious,” Noyes notes that the Bears Ears proposal has been in the works for several years. Brian Maffly writes about public lands for the Pulitzer-winning Salt Lake Tribune, Utah’s largest newspaper.